As is true of many physical symptoms, the conditions that cause eye redness range from the pathetically benign (staying up past bedtime) to the decidedly dangerous (acute glaucoma). As noted in Sun Gets in Your Eyes, eyes and eyelids are sensitive structures: Abuse them and you’ll see (and feel) the effects quickly. Stop the abuse, however, and your eyes will usually return to normal fairly quickly. The problem, however, is that some causes of eye redness don’t just go away: You may need to seek medical treatment to address an underlying condition. 1. Protecting Eye Health: Sure, your pinkish peepers may simply be the result of one too many late nights, but there are other causes of eye redness (see below) that can’t be cured by a good night’s sleep and, if left untreated, can cause vision loss. 2. Looking Pretty: Forget about crow’s feet, nothing ages a person more dramatically than eye redness (and frankly, chronically bloodshot eyes can cause people to wonder about your personal habits). Since even mild redness can dull the whites of your eyes, getting treatment is important. 1. Conjunctivitis: Remember “pink eye” from your school days? This particularly disgusting affliction that not only made your eyes horribly bloodshot, but often caused them to ooze a nasty green pus, gluing your eyelids shut during the night. Because bacterial/viral conjunctivitis is so catching, it’s important to follow your doctor’s instructions about returning to work or school while you recover. 2. Contaminated Makeup: While it’s tempting to scrape the last of your high-end mascara out of its tube or to resurrect that old eyeshadow pan that’s been hiding in your backpack, don’t. Contaminated eye makeup can lead to eye irritation and infection. Be safe and toss eye makeup after four to six months of use. If you do develop an eye infection, get rid of all your eye makeup to prevent re-contamination. 3. Environmental Factors: Allergies to ragweed or pets, as well as exposure to environmental pollutants, can cause irritated, red eyes. Your doctor can run tests to diagnose allergies and may be able to prescribe soothing eye drops or an antihistamine to help manage your condition. 4. Occular Rosacea: Many people are familiar with rosacea, facial flushing that can result in a ruddy complexion and, in some cases, acne-like bumps on the skin. Sometimes this condition affects the eyes as well, causing red, dry eyes. Like skin rosacea, occular rosacea often worsens over time and, if left untreated, sometimes contributes to vision loss. Doctors can prescribe antibiotics and eye drops to manage symptoms, though you will likely have to do your part and avoid rosacea triggers such as alcohol, spicy food, and hot beverages. 5. Acute Glaucoma: While glaucoma is often a slowly progressing disease, with symptoms worsening over time, it’s possible for the condition to come on suddenly. If you suddenly develop eye redness, develop visual disturbances such as seeking rainbow “halos” around objects or experience severe pain in an eye, seek medical care immediately. 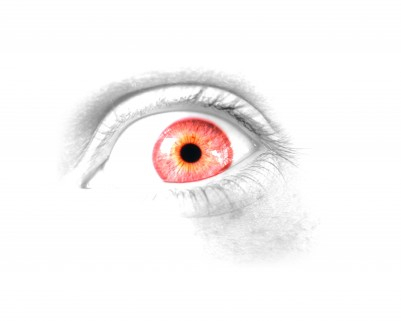 Keep in mind that eye redness, while common, isn’t actually normal: When your eyes turn red, they are trying to tell you that something is amiss. Take action by taking stock of your lifestyle and, if necessary, getting help from a medical professional.